“As a drop of water, we cannot go far; we cannot arrive at the ocean. Inspired by the teachings of Thich Nhat Hanh, ‘sanghas’ have been founded all around the world to give support to one another in the practice. The Almond Blossom Sangha comes together for a Sunday morning of Mindfulness and picnic lunch once a month. During these mornings we practice full awareness in all that we do: with each step, with each breath. 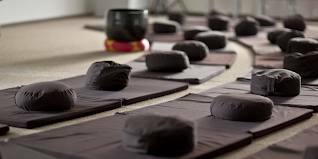 Activities may include: guided and silent sitting meditation, listening to a Dharma teaching, mindful movements, Qi Gong stick exercises, guided Deep Relaxation, Touching the Earth practice, walking meditation and mindful sharing, followed by a mindful picnic lunch. Once a month we also enjoy a two-hour walking meditation at different locations in nature around the Algarve. During the walk, we stop and enjoy a short silent sitting meditation followed by a cup of tea. Languages spoken are English and Portuguese.